Bashar al-Assad's Syrian army, backed by heavy airstrikes by Russia's warplanes, is close to recapturing Palmyra from the so-called Islamic State (IS or ISIS or ISIL or Daesh), according to Syrian state media. Russian jets carried out 40 air sorties near Palmyra in the past day, hitting 158 targets and killing over 100 militants. ISIS invaded and captured in May of last year, and caused worldwide outrage by destruction of monuments and antiquities that were millennia old. 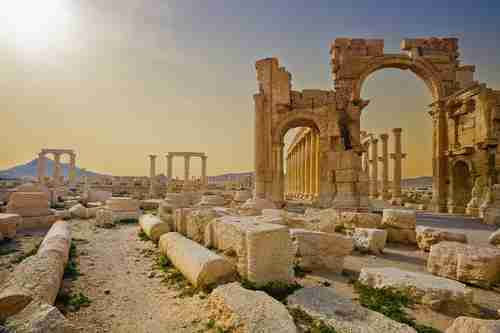 Syrian officials claim that many of the destroyed antiquities will be restored. At the same time, Iraqi forces, aided by airstrikes from American and Turkish warplanes striking ISIS positions, overran a string of ISIS-controlled villages in northern Iraq. "They don’t fight. They just send car bombs and then run away. And when we surround them, they either surrender or infiltrate themselves among the civilians. Their morale is shaken. We listen to them on their communications devices. Their leaders are begging them to fight, but they answer that it is a lost cause. They refuse to obey orders and run away." "As time goes on, as our systems mature, we’re becoming more effective. We’ve become much better at spotting them. Anytime they try to move, we’re able to find and finish them. They can’t move, haven’t won any battles for a long time, and they’ve got difficulty leading because we’re hitting their leaders." It's not surprising that there's little will to fight among ISIS fighters. Most of them have come from countries around the world, and there's little reason for a jihadist from Indonesia or Algeria to want to give up his life in Iraq or Syria. The Iraq ground invasion in 2003 succeeded within about three months, mainly because Saddam Hussein's army really didn't want to fight. After their defeat, there was relatively little direct fighting beyond responding to IEDs and suicide bombers. But as I wrote in 2007 in "Iraqi Sunnis are turning against al-Qaeda in Iraq", the Iraqis never had their heart in fighting the Americans, and al-Qaeda in Iraq had to depend on foreign fighters. But even they were ejected by the Iraqi Sunnis with the help of President George Bush's "surge," which largely stabilized the country. The victory in Iraq was squandered by the withdrawal of all American forces in 2009, but even so, when the war in Syria began in 2011, it should have ended within a year or so, and I said so at the time. Both Iraq and Syria are in generational Awakening eras, where there are still plenty of people alive who survived the extremely horrific Syrian civil war and the Iran/Iraq war of the 1980s, the latter climaxing with the use of chemical weapons by Saddam in 1988. The 1991 Iraq war ended quickly, the 2003 Iraq war ended quickly, and the 2011 Syrian war should have ended quickly, all for the same reasons: a generational Awakening era. The reason that Syria was anomalous was because of one man, president Bashar al-Assad, who acted as a sociopathic genocidal monster, supported by Russia and Iran, targeting innocent protestor civilians as if they were cockroaches to be exterminated. Another difference between the Syria war versus the two Iraq wars was that America fulfilled its role as policeman of the world and stopped them. In 1990, Saddam Hussein tried to annex Kuwait, just as Hitler tried to annex territories in 1939. but the first Gulf War forced Saddam to retreat. In 2003, fear of WMDs led to the second Gulf War, that forced Saddam out of office. President Obama could have stopped al-Assad on a couple of occasions, but he refused to do so, referring to the Iraq war as a disaster, despite its successful conclusion. As a result, al-Assad was not stopped, and has created the biggest catastrophe since World War II -- millions of refugees, and the rise of ISIS. So among these wars that I've been describing, the leader was stopped in two of them, and the leader was allowed to continue with impunity in the third. But what all three have in common was the soldiers have little will to fight, which is what you would expect in a generational Awakening era. Reports are that we're seeing the same thing happen in Iraq, among Iraqi soldiers who are supposed to be conducting the operations to retake Mosul from ISIS. According to one report, Iraqi soldiers fled in panic over fear of mortar attacks from ISIS. Few stood their ground. President Obama has said many times that there would never be "any kind of military action that would involve boots on the ground." Like many of his campaign promises, his promises of complete withdrawal from Iraq and Afghanistan have not been kept. Instead, he's being forced to commit more and more troops to Iraq, and to delay troop withdrawals in other places.